After the arrival of the automobile, demand for an expanded highway system and better roads in America was recognized during World War I. To create the infrastructure, many areas of the country required better draining resulting in strong demand for concrete tile. 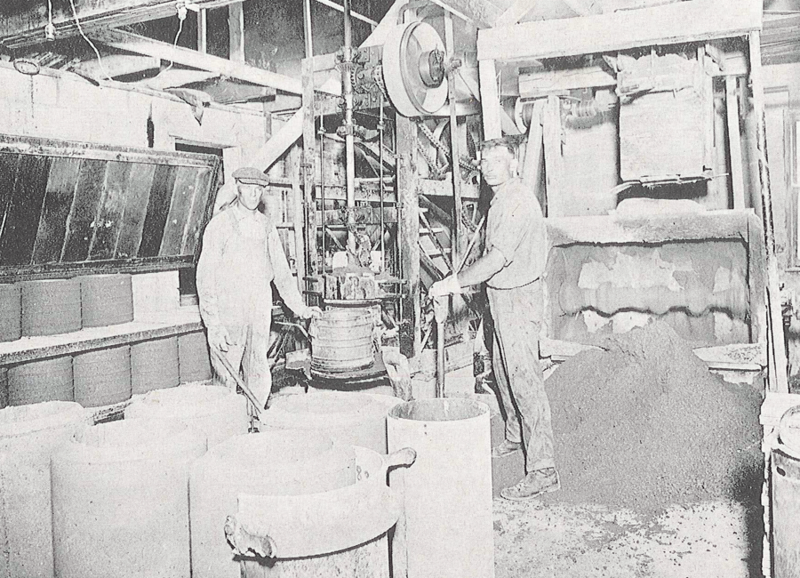 A recent implant from Illinois, Henry Schmidgall, recognized the opportunity and purchased a small drain tile plant in Hancock, Minnesota, in 1917. He named his new business Hancock Concrete and started building a foundation strong enough to endure the next century of ups and downs. 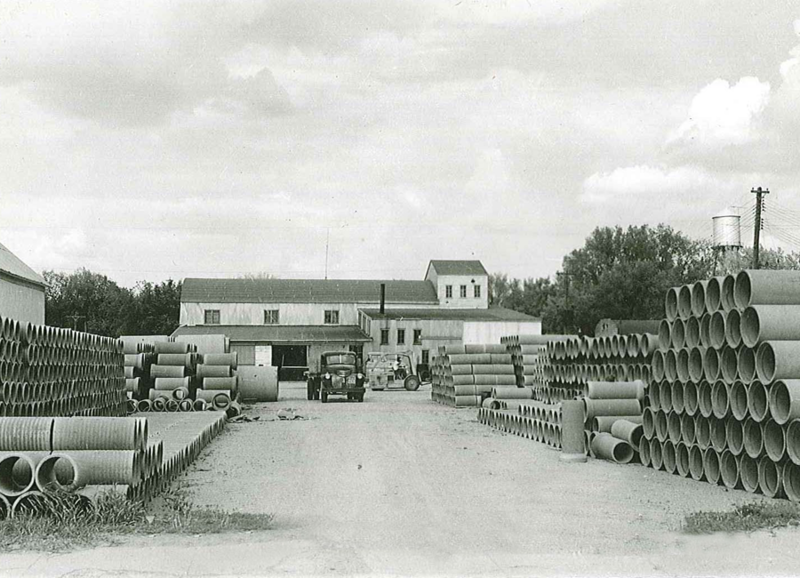 During the first few years in business, Mr. Schmidgall and crew focused their manufacturing efforts on road drainage tiles and building blocks. Back then, Hancock used horses and wagons to haul sand, gravel and cement to the factory. A series of rails transferred the tiles and blocks into a kiln where the product was steamed overnight. The following day the tiles and block were hand stacked in the yard. 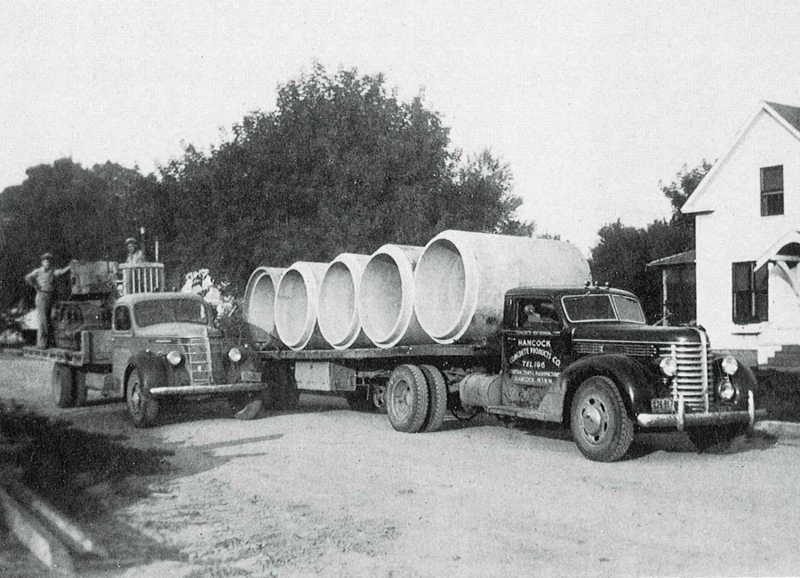 In 1925, Hancock Concrete produced its first reinforced concrete pipe. These were poured, rodded and tapped with a hammer to settle the wet concrete. The next day, the forms were stripped and the process repeated. Three years later, a new method utilizing quick drying concrete and precast forms was developed, which increased production by about 25-30 additional pieces per day. In the middle part of that first century, arch pipe was added to the company’s product line. Also during the 1950’s, Hancock experimented by tying concrete pipe together in a series for culverts. Later coined the “Hancock U-Tie,” this method was quickly welcomed and accepted as standard industry practice. In 1965, almost a half century after founding his business, Henry Schmidgall passed away at the age of 76. After learning and studying the business by their father’s side for so many years, sons Richard and Eugene became the primary leaders of Henry’s growing business. Not long after, the industry was experiencing changes as companies began to focus on precise engineering and design standards. In addition, the Minnesota Highway Department was looking for larger arch pipe to be used to replace bridges for waterways so Hancock worked with them and designed the world’s largest concrete arch pipe which was 169” span and had 100 square foot opening. The Highway Department referred to the large arch pipe as the “Schmidgall Arch” since nobody made arch pipe larger than 102” span. In 1974, Hancock gained regional notoriety in the industry when they worked with MnDOT to design, build and install the first precast box culvert in the state of Minnesota. Seven years later came more innovation when, with help from an engineering firm in Switzerland, Hancock designers introduced the BEBO bridge concrete arch system to America. The BEBO system is a combination of cast-in-place concrete footings, precast arch elements, headwalls and wingwalls. Engineers used the fundamentals of soil-structure interaction to achieve superior strength and stability with spans over 40’. 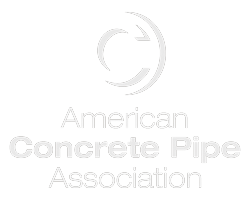 During the last century, Hancock concrete has continued to grow to meet changing needs for concrete pipe. Along with changes in product, the 100-year-old company also expanded production, buildings and employment. In 1976, the first satellite plant was added in Cannon Falls, Minnesota, a small community located about an hour southeast of Minneapolis. Six years later, Hancock added another production facility. This one, in New Ulm, Minnesota, is located southwest of the Twin Cities. The New Ulm facility was later replaced by a brand new factory in nearby Courtland, Minnesota, in 2002. In 1992, Hancock Concrete expanded beyond the boundaries of Minnesota and into Iowa, acquiring businesses in Lake View and Sibley. Later, the manufacturer gained citizenship in Devils Lake, North Dakota, and Sioux Falls, South Dakota, which helped transition Hancock into a major supplier in the Upper Midwest. In 2011, Hancock Concrete was acquired by Superior Industries, a manufacturer with 1,500 employees and $300 million in annual revenue. The company’s headquarters is about ten miles from Hancock in Morris, Minnesota. 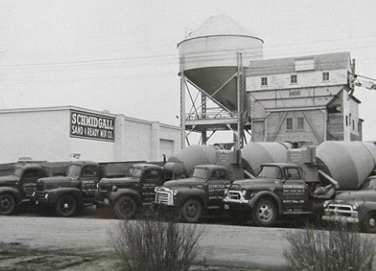 Superior Industries was founded by Henry Schmidgall’s grandson, Neil Schmidgall, in 1972. 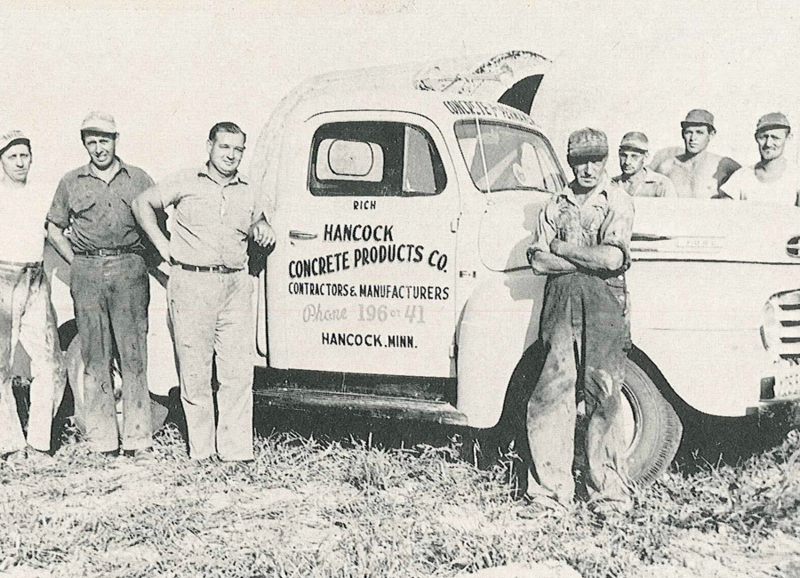 Before growing his business into a worldwide supplier, Neil built the portable plants and conveyors that produced the sand and gravel consumed by Grandpa Henry and his team at Hancock Concrete.